Solution for Windows 8, 8.1 and 10 to create program shortcuts on the desktop! Via the new Windows 8/8.1 Start Menu -Search- and open the folder path or open the location! see: .... In Windows 8 will find the program folder! click on the program icon (right-click) and choose Send To, Desktop (shortcut) (... see Image-1 Arrow-1) and you have an Internet Explorer shortcut on the Windows 8 desktop (... see Image-1 Arrow-2). At this point you can also pin the Program on Windows 8.1/8 start (... see Image-1 Arrow-3)! See also: ... open in Windows 8.1 the program path through the task manager while the program is running! and: ... shortcut for Excel, Outlook, Word 2013 on the Windows 8.1 Desktop (Office)! (Image-1) Windows 8/8.1 - Program shortcuts on the desktop or pin to Start! Windows-8 - FAQ-95: Create desktop program shortcuts in Windows 8/8.1 and Win 10! Windows 8.1 program to desktop? How to make short cut to a program on Window 8.1 and windows 10? Add internet shortcut to metro windows 8.1 and windows 10? Create desktop icon for program windows 8.1? Internet explorer shortcut windows 8.1 desktop? How to create an short cut on desktop of office application in Windows 8.1? Add program shortcut to desktop in 8.1? 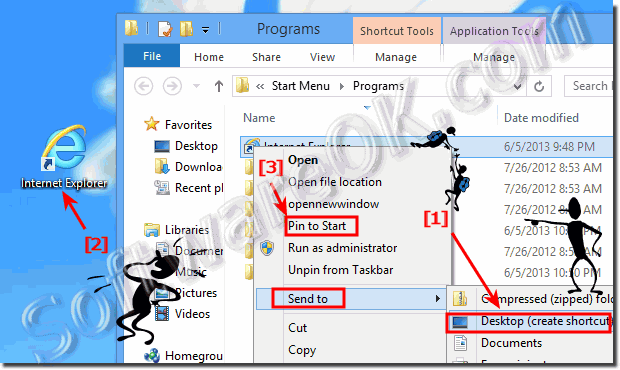 How to create shortcuts for programs in windows 8.1? Windows 8.1 program shortcuts on desktop? Create desktop shortcut windows 8.1? Win 8.1 how to create office on desktop? Is ther a duplicate desktop shortcut windows 8.1? Win 8.1 pro shortcut program? Applications metro desktop all windows 8.1 shortcut? Shortcuts on win 8.1 desktop? How to create an icon for internet connection on the desktop window 8.1? Windows 8.1 shortcut to programs on desktop? Program shortcut in window 8 and 8.1!? In windows 8.1 desktop shortcuts management program? Windows 8.1 can programs downloaded to desktop have shortcut on start page? How do you add program shortcut to desktop in win 8.1? Windows 8.1 shortcut to file on desktop? Windows 8.1 creating shortcuts for programs? Unable to create desktop shortcuts in Windows 8.1? Windows 8.1 place program on desktop? Win 8.1 add app shortcut to desktop? How to create desktop shortcut windows 8.1? Adding program shortcut on desktop? Desktop shortcuts for programs in Windows 8 ans 8.1? Windows 8.1 Create Desktop Shortcuts? How to place internet explorer icon on desktop windows 8.1? Win 8.1 start 2 programs with one shortcut? How to put program shortcut on desktop windows 8.1? Making shortcuts on the desktop on win 8.1 and windows 10? Windows 8.1 how to add program shortcuts to desktop? How to create desktop shortcuts in windows 8.1? How to create a shortcut for internet explorer on desktop windows 8.1? Where is win 8.1 program list shortcut in file structure? How to create a shortcut to a program? Create Program Shortcut in Windows 8.1 and how to create shortcuts for Office in Windows 8.1? Desktop shortcuts in windows 8.1 and windows 10? Remove shortcuts in drives win8.1? How to create windows 8.1 desktop shortcuts can you use? Windows 8.1 create program shortcut? How to make shortcut in win 8.1 to desktop? How to make shortcut of any programme in win 8.1? Create desktop shortcuts windows 8.1? Creating shortcuts in windows 8? Shortcuts on the desktop and windows 8 and metro? Windows 8.1 programs menu shortcut? Windows 8.1 shortcut for internet explorer? Program to create desktop shortcut to check and repair a hard drive in windows 8.1? Creating a shortcut in win 8.1 and windows 10? Windows 8.1 create shortcut on desktop for progams? Create a shortcut for my computer in desktop windows 8.1 and windows 10? Windows 8.1 desktop how to create program shortcut? Creating desktop shortcuts in windows 8.1 and windows 10? How to make desktop shortcuts in windows 8.1? Windows 8.1 desktop create shortcut for ie? How to add program shortcut to win 8.1 desktop? Place program shortcut windows 8.1 and windows 10? Create program shortcut in windows 8.1 and windows 10? Create shortcuts on desktop windows 8.1? How to create a program shortcut on desktop in windows 8.1 and windows 10? Add shortcut to windows 8.1 metro? How to create shortcuts in windows 8.1 and windows 10? Create desktop shortcut windows 8.1 and windows 10?